7 Eleven Brewed Coffee is freshly brewed hourly at 7 Eleven convenience stores. This is the average amount one would expect in their Regular Exclusive Blend. During this lab test conducted by BuzzFeed, samples ranged from 224 mg to 357 mg in caffeine. Also, 7 Eleven's other blends and roasts could also vary in caffeine from what's listed here. 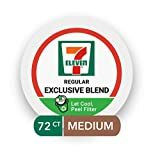 7 Eleven Brewed Coffee contains 17.50 mgs of caffeine per fluid ounce (59.17mg/100 ml).